ASRock, Bryce, and fkhsr team up across continents and deliver quite the Z77 VT-d/VMDirectPath article and test matrix, thank you! If you are keen on shopping for a Z77 motherboard, and really have your heart set on VMDirectPath, then this article is for you! It goes way more in depth than my original, July 2011 spreadsheet about Z68 VMDirectPath successes and failures at TinkerTry.com/vmdirectpath, and related article TinkerTry.com/sandybridgeversusivybridge. VT-d capability is handy for when you'd like to be able to "pin" current and future PCI devices to a particular VM, side-stepping devices that the hypervisor itself doesn't support. Such as assigning HighPoint USB 3.0 card ports to a Windows VM, which works great with tinkertry.com/vzilla for example. Or perhaps a Thunderbolt card, assuming they ever become affordable. Below is a reformatted, but unedited, forum-like dialogue between site visitor Bryce and fkhsr, pulled from the active Disqus comments below this popular (13,000 views) TinkerTry.com/sandybridgeversusivybridge article. Enjoy! I'm looking to replicate your ASRock Z68 build on Z77. However, according the manual the ASRock Z77 Professional board no longer includes the option to enable VT-d in the Advanced North Bridge Sections. Other than the upgraded Intel chip set its very similar to your Z68 board, which means it offers good Ethernet and SATA compatibly with ESXi 5. 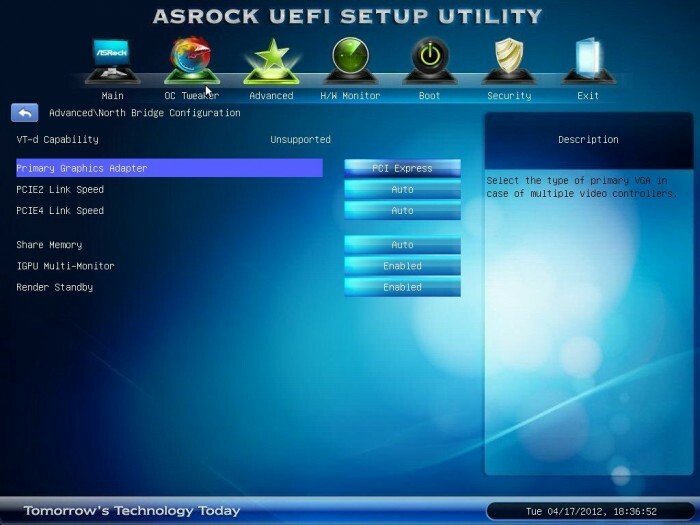 I have an inquiry out to ASRock to see if the feature is truly gone. 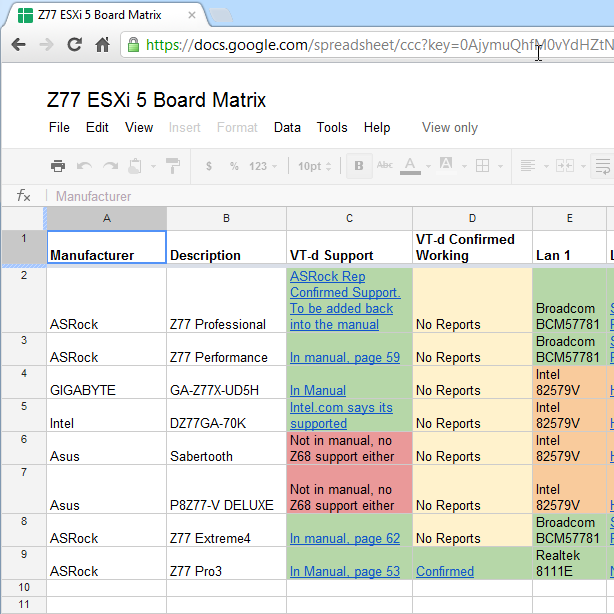 I've been compiling a spreadsheet of some high end Z77 boards. Here is what I have so far. If you or anyone would like to contribute I think it would be a valuable resource. For each board in question I've been thru manuals or found speficications. I'll update links in the the spreadsheet comments. Thanks so much for the testing, I'm kind of in the same situation as Bryce (looking to replicate your setup on Z77, for gaming and other stuff) ; i have been searching quite a while to find out that manufacturers don't communicate that much about it..
Last but not least it is maybe best to also ask Intel if the Z77 chipset does support VT-D. I found that the Z77 Extreme6, Z77 Extreme4 and Z77 Pro4 all have an option in the BIOS for Intel virtualization Technology (VMM) based on the Vanderpool protocol. Last but not least it is maybe best to also ask Intel if the Z77 chipset does support VT-D. I found that the Z77 Extreme6, Z77 Extreme4 and Z77 Pro4 all have an option in the BIOS for Intel virtualization Technology (VMM) based on the Vanderpool protocol. Intel is supporting VT-d on their flagship Z77 board, the DZ77GA-70K. http://www.intel.com/support/motherboards/desktop/sb/cs-030922.htm If you have an open line of communication with ASRock refer them to this link. I've finally gotten a ASRock rep to confirm support. The Z77 Professional Manual will be updated to include VT-d Support. Best affordable Intel CPU to buy for your personal virtualization project, Core i7 2600, not the 2600K! Sorry for the delay, I've just passed this info onto asrock support in Netherlands (maybe tinkererguy passed it onto ASRock US and they may not have shared the info). Anyway I'l keep an eye on the web to find new info (especially at TinkerTry.com ;) ) and keep you informed if I find some info I think is relevant to us. Anyway one thing is sure : I'll be ready to build my rig on july this year ; hopefully more info is available till then. Have recently finished building my own ASRock Z77 Extreme4 with LSI MegaRAID 2965 SAS controller (including CacheCade 2.0) thanks to the great advice on this site. I actually ended up building my own ESXi install image with all the drivers I needed in it and thought this might be useful to others so have included my notes on using VMware PowerCLI to build a custom install ISO from the latest ESXi release including security updates below. Note after downloading the extra ESXi drivers I had unziped them to my working directory. Download ESXi 5 drivers from LSI and from VMWare. Export-EsxImageProfile -ImageProfile ESXi-5.0.0-20120511001-Custom -ExportToBundle -FilePath " ESXi-5.0.0-20120511001-Custom.zip"
Export-EsxImageProfile -ImageProfile ESXi-5.0.0-20120511001-Custom -ExportToISO -FilePath "ESXi-5.0.0-20120511001-Custom.iso"
Read all the build details, see photos, and a lot of screenshots over at vEsuvio 4.0 – ivy bridge whitebox. Enjoy!